Organe de l'Eglise Gnostique de France (Christianisme ésotérique et scientifique). 1/1-10, January 1900 to January 1901. 4-6 pp., 2 francs a year. A journal devoted to explaining the fine points of Neo-Gnosticism to those interested and to proselytizing for the Eglise Gnostique de France. The neo-Gnostic, neo-Cathar, neo-Albigensian, and neo-Manichaean strains of French Golden Age occultism intermingled in this journal can all be traced back to Jules Doinel (1842-1903), a former Jesuit seminarian who became an archivist and municipal librarian. Through his archival work he developed an affinity for the Cathars and was favored in 1889 with a vision of the Eon Jesus who consecrated him bishop. He deepened his knowledge of the Cathars and their doctrines at the Paris home of Marie, Countess of Caithness and Duchess of Medina Pomar, during pendulum-seances with the spirits of martyred Cathars and with the Gnostic Helene-Sophia herself. Lady Caithness (1830-1895) was one of the focal points of French occultism of the period and believed, inter alia, that she was the reincarnation of Mary Stuart and that 1881 marked the beginning of a new world era. She published L'Aurore du Jour. She was a friend and early supporter of H.P. Blavatsky and organized one of the competing Theosophical Societies in France, but her brand of Theosophy was decidedly more Western and Christian than that of her friend, and the circle that gathered around her tended to favor the same, in contrast to the more orthodox Theosophical view of the time. Some of her group (Abbé Roca, "Alber Jhouney" (Albert Jounet, 1863-1923), Rene Caillie, et al. ), founded the catholicizing L'Etoile, Revue mensuelle: Kabbale messianique, Socialisme chretien, Spiritualisme experimental, Litterature et Art, to which Doinel contributed, in the hope of developing an occidental occultism without recourse to the East; some, including Doinel himself, went over completely to Gnosticism. In 1890 Doinel founded his Gnostic Church and proclaimed himself Patriarch Valentinian (and, in 1893, Primate of the Albigensians), announcing the new dispensation in Papus's L'Initiation. Most of the current wave of French occultists joined -- Papus (Gerard Encausse), Louis-Sophrone Fugairon (1846- ), Paul Sedir (Yvon Le Loup), Lucien Chamuel (Mauchel), Leonce-Eugene Fabre des Essarts (1848-1899)—and the church was closely allied with Papus's Martinist Order. After this simple (by the standards of the time) beginning, things got complicated. Doinel awakened to his error, rejoined the Catholic Church, and denounced Gnosticism in a scathing book entitled Lucifer Demasque written under the pseudonym Jean Kostka (a Jesuit saint) -- though he later sought re-admittance to the Gnostics—leaving the Gnostic Church under the control of Fabre des Essarts. In 1907, Jean Bricaud (1881-1934), one of Fabre des Essarts' episcopal creations, broke with his master and, with Papus and Fugairon and others, began their own Eglise Catholique Gnostique—a more "Catholic"-appearing organization with strong ties to the Martinist Order. 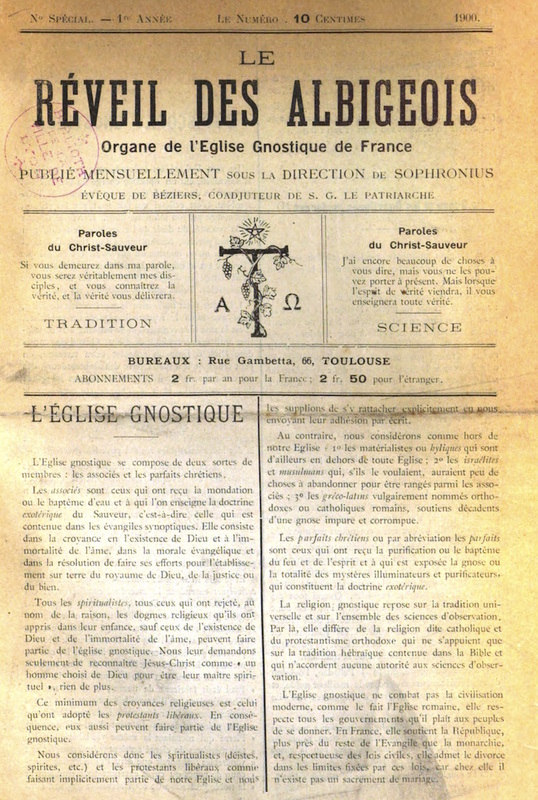 At the Conference Maçonnique et Spiritualiste Internationale held in Paris in 1908, this congeries of groups (then known as the Eglise Gnostique Universelle) was associated with the Swedenborgian Rite and the Rites of Memphis and Misraim (all under the control of Theodor Reuss, and all forming the foundation of the O.T.O., the Ordo Templi Orientis). One result was the founding of yet another journal, La Gnose, this time by Rene Guenon ("Palingenius," as he was known as a Gnostic bishop), as the Organe de l'Eglise gnostique universelle. This allowed Guenon a forum in which to publish his most important early works. The subsequent history of these neo-Gnostics is the history of the various branches of the O.T.O., each of which claimed apostolic-descent from one or the other branches of the Gnostic Church. The letters of Deodat Roche, the enthusiastic and poetical assistant of Dr. Fugairon, on the travails of publishing Le Reveil des Albigeois can be found now in Jean-Pierre Bonnerot, "Deodat Roche et l'Eglise Gnostique: Les Eveques du Paraclet et la Restauration de l'Eglise Gnostique," Cahiers des etudes Cathares, now online at ezooccult.net/IMG/deodat.pdf .